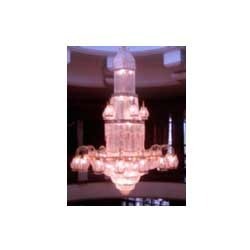 Established in the year, 1980, we, Nice Lamps, are manufacturing, exporting, trading and supplying in Electricity Saver LED Modern Crystal Glass Chandeliers, Antique Cut & All kind of Chandeliers. Manufactured in line with latest fashion trends, these find application in offices, restaurants, malls, resorts, kothis, gurudwara, masjid, mandir, hotels. These are appreciated for sparkling & stunning designs and help in enhancing the decor of the interior. Proficiency and expertise of our professionals allow us to offer products as per the requirements of our clients. Our professionals stringently test our range on well-defined quality parameters to assure the passage of excellent quality products from our promises. Further, we carefully pack our products to assure the delivery of products to clients in an appropriate condition. Some of our eminent clients are P.W.D, C.P.W.D, PSU, ITBP, BSF and so many private sectors.